Objects tell many different stories, depending on where we see them and for what we look. 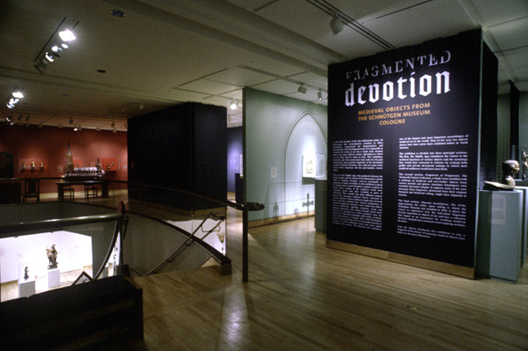 This exhibition asks what stories material fragments of the devotional world of medieval Christians have told over the past millennium. 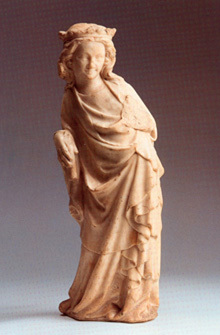 The art of the Middle Ages, that produced between the fourth century and the advent of the Renaissance (about 1500 in Northern Europe), survives principally as fragments of larger ensembles. This exhibition explores the contexts in which these vestiges of the medieval world were originally shown and, later, installed as parts of collections. The objects are culled primarily from the collection of Alexander Schnütgen (1843-1918), a Catholic priest and collector in Cologne. Since 1910 Schnütgens collection has formed the core of a municipal museum of Cologne. The Museum now has one of the largest and most important collections of medieval art in the world. Most of the sixty-two objects shown here have never been exhibited before in North America. The exhibition is divided into three principal sections. 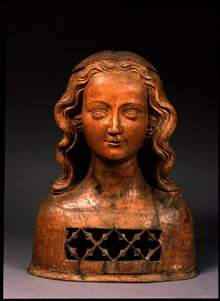 The first, The Middle Ages, introduces the viewer to the medieval functions of various objects and the meanings they would have conveyed to viewers, by evoking both public and private devotional settings in which their medieval audiences would have seen them. The second section, Fragments of Fragments: The Nineteenth-Century Collection, a single room installed with a mÈlange of medieval and neo-Gothic objects from various periods and places, simulates Schnütgen's own crowded, decorative display. It explores some of the new messages these fragments, abstracted from their original liturgical and historical setting, might have imparted to viewers. The final section, Museum Installation: The 1930s, approximates the white, spare setting in which the Schnütgen Museum was installed in 1932. It allows the viewer to experience how the individual fragments became important as objects of art, and how a collection that began as an instrument for recalling medieval devotion changed into a museum of art inspiring aesthetic devotion. 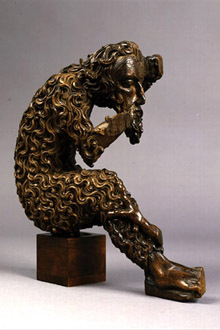 Wild Man from a Choir Stall Like the objects displayed, this exhibition is only a fragment of the history of meanings medieval objects have held over the past millennium. Like the exhibition itself, the catalogue of approximately 180 pages is intended to be a major scholarly contribution. The catalogue is edited by Profs. Nancy Netzer and Virginia Reinburg. published by the McMullen Museum, and distributed by the Boston College bookstore and the University of Chicago Press. It contains short entries on the individual works focusing on their devotional use written by Dr. Ulrike Mathies. All works are illustrated either in black and white or color. The catalogue includes an introduction by the editors and six essays focusing on various sections of the exhibition: the role of the exhibited objects in medieval religious practices (Prof. Virginia Reinburg, history, and Prof. Patricia DeLeeuw, theology); the collecting of medieval fragments, their display and their relationship to the emergence of art history in the nineteenth and twentieth centuries (Prof. Nancy Netzer, art history); Alexander Schnütgen as collector (Dr. Hiltrud Westermann, director of the Schnütgen Museum); Schnütgen's collection as a reflection of the character of German Catholicism in the second half of the nineteenth century (Prof. Donald Dietrich, theology); and how the display of the Schnütgen collection in the twentieth century reflects the desire among some German Christians to construct from a complex Christian past a devotional life relevant for a new age, and how this refashioning left it vulnerable to fascist exploitation (Prof. James Bernauer, philosophy).